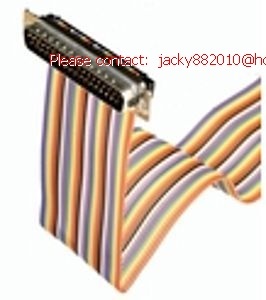 This series is equiped with IDC contacts to assemble ribbon cables with AWG 28. The stamped contacts are selectively gold plated over nickel in the mating area. The connectors are also available with strain relief. Alternatively standard ø 3,1 mm, inner thread or threaded spacer (4-40 UNC or M3) can be used. Other platings can be manufatured on request. Low assembly costs as all contacts are connected at once. Pin connectors are shielded with dimples.